And its usually about this point that you want to jab little Jimmy in his eye for not listening to your wonderful lesson. In truth it could just have been that the task was too great for little Jimmy’s frail maths brain and he hasn’t the resilience or confidence to just have a go. As we move towards the new spec syllabus we’re invariably going to encounter more of those dastardly star type questions which assume our children have some sense of problem solving ability and well… they don’t! And so it’s up to us to get them thinking logically and efficiently so to give them their best chance at success. State The Bloody (Blimmin’!) Obvious! Use The Bloody (Blimmin’!) Obvious! Sounds simple, is simple. Can be used to great effect. 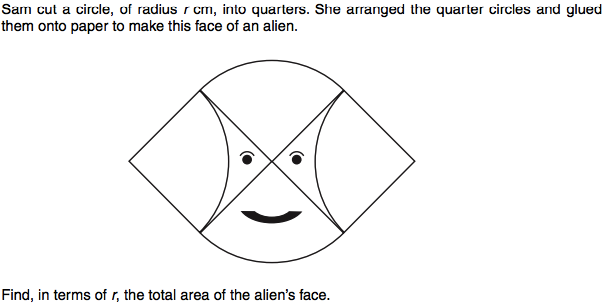 nasty little geometry question from an OCR practice paper. How can you train a child to attack a question like this? – There are extra white bits where the eyes are that are not part of the circle. – It’s an area question involving circles… so find the area of a circle. – What would the area of the square be? From here it would be down to the child’s own skill to solve but at least a pupil will begin to feel as if they are moving towards an answer. It might take a while for a child to grasp the concept of how to STBO and UTBO efficiently but when they do you’ll be surprised at how well they begin to answer the harder questions. My current year 7 may not always get these questions correct but by George they don’t have give them a go. Try it, see for yourself how much confidence it can give.